All Pasadena residents are advised to avoid outside activity, run air filters or air conditioners that don’t draw in outside air, monitor fire and smoke status via local news organizations and be prepared to leave homes if conditions change. If the fire reaches antennas on Mt. Wilson and damages TV and radio transmission equipment, the Pasadena Fire Department advises residents who don’t have cable to get updates on news affecting Pasadena from www.cityofpasadena.net. 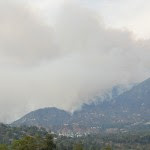 Updates on nearby fires also can be found at http://inciweb.org/incident/1856, http://www.lacanadaflintridge.com and www.altadenablog.com. As of Sunday morning, residents of the Florecita neighborhood in Pasadena were notified that they may return to their homes. 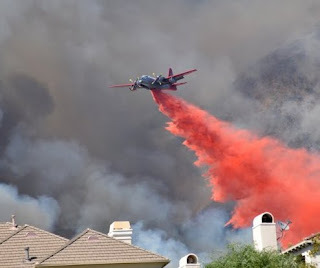 However, if conditions change and evacuation orders are issued by local authorities, residents are asked to comply with the orders to prevent loss of life and ensure that firefighting efforts are not compromised. The Pasadena Fire Department has had 10 personnel assigned to the Station Fire since last Friday. Smoke and ash from the Station Fire are still heavy today, so everyone is advised by the Pasadena Public Health Department to avoid outside activity, especially elderly residents, children, pregnant women and people who have heart or respiratory health issues. Schools that are in session, after-school programs and sports organizations for children (such as Little League) are advised to cancel outdoor practices in areas where there is visible smoke, soot or ash, or where there is an odor of smoke. Outdoor activities should be suspended until conditions improve. * If outdoor air is bad, try to keep indoor air as clean as possible by keeping windows and doors closed. Air conditioners that re-circulate air within the home can help filter out harmful particles. * Avoid using air conditioning units that only draw in air from the outside or that do not have a re-circulating option. Residents should check the filters on their air conditioners and replace them regularly. Indoor air filtration devices with HEPA filters can further reduce the level of particles that circulate indoors. * If it is too hot during the day to keep doors or windows closed and you do not have an air conditioning unit that re-circulates indoor air, consider going to an air conditioned public place, such as a library or shopping center, to stay cool and protect yourself from harmful air. * Do not use wood-burning or gas fireplaces, candles and vacuums. Use damp cloths to clean dusty indoor surfaces. Do not smoke. * If you have symptoms of lung or heart disease that may be related to smoke exposure, including severe coughing, shortness of breath, difficulty breathing, wheezing, chest tightness or pain, palpitations, nausea or unusual fatigue or lightheadedness, contact your physician immediately or go to an urgent care center. * When smoke is heavy for a prolonged period of time, fine particles can build up indoors even though you may not be able to see them. Wearing a mask may prevent exposures to large particles. However, most masks do not prevent exposure to fine particles and toxic gases, which may be more dangerous to your health. All Pasadena residents and businesses should review their personal, family and workplace emergency plans and make sure their emergency preparedness kits are up to date. More information about emergency preparedness can be found at www.cityofpasadena.net/disaster; more information about preventing the health impacts of fire-related smoke can be found at www.aqmd.gov/ej/cac/wildfire_safety_tips.htm. Due to hot temperatures, possible gusty winds and low humidity expected to fall below 10 percent for several hours today, the National Weather Service has issued a red flag warning – a higher risk of wildfires – that will be in effect in the mountains of Los Angeles County until 9 p.m. tonight. I am delighted to be among friends. I know friends when I see them. The interesting thing about you is that you are a cross-section of American society. Few of you were bred in Pasadena or in California. You are from here, there and elsewhere -- all detached places off the boulder of America. You have blasted away the old hillsides and walks where the true veins of ore are exposed to the light. Most of you are Californians by adoption. Underneath you are a sample of America. The wonderful thing about you is that you have escaped the provincialism of certain parts of the east. New York is interesting because it is one of the most provincial places in the world. All news in which New York is particularly interested affects New York. New York handles most of the country's money and must be asked permission to let things go on. All the rest of the United States is moving on: New York is still sitting still. I have one obvious explanation, that she is sitting and taking toll at the customs house. Some people think of the history of America as the history of the expansion of New England. I once discussed that with a New Englander. His reply was, "Isn't it?" I told him we had better not discuss the subject. 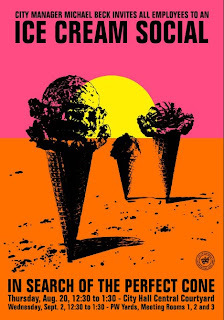 You Californians are of a new pattern, or new stuff, of new color. You are more than merely an expansion of the Eastern coast, but you must not think that the East is an expansion of the West. You owe the East something for your great progress, your prosperity, your unprovincialism. You can't move out of the Eastern states and lose a prepossession of the Eastern states. We are more inextricably and inconveniently interlaced in the East. It is very difficult to get away from this without openly being charged with irreverence. That American flag there stands for the biggest kick ever recorded. As far back as the English constitution goes, quoting Tennyson, 'The great stream of liberty has broken down every precedent.' America in bonds found her young life intolerable. She committed an act of extraordinary irreverence and radicalism. Did it ever occur to you who led the American revolution? Perhaps because of my prepossession as a Virginian you might not take me seriously but the fact is that it was Virginia. She had every material reason to adhere to the old country and no reason at all to break the thongs. The mother country courted her favor and loyalty, but she cut deep the root of independence and took the leadership. Her stand for independence is not paralleled elsewhere in the history of political development. The emblem of liberty is not all tradition. No man can inherit the true traditions of our emblem and be bound. The task of statesmanship is the forecasting of things as they must come, and foreshadowing what is to be done to meet these things. Don't suppose that the elements of all life are laid above the surface. Don't suppose that on September 15 last when I was nominated for governor I emerged from an academic seclusion. Don't suppose that politics are unknown at Princeton university. It is seething with politics. Politics are so strong there that the real article seems like an amateur. We must disentangle the progress of the life of the interests. Did you ever notice that this problem of the interests is interlaced with every part of public life? The time has arrived that the American people insist that everybody implicated with the interests shall change their point of view. It has been the habit — pardon the classic — for gentlemen of great corporate wealth to say 'The public be damned.' The object of business is not to do anybody, not to exploit anybody. The object of business is to derive a reasonable profit by rendering real and honest service. If you derive a profit by not rendering real and honest service you are a thief. If your charges are unreasonable you are an extortionist. If you shut others out of business you are a public enemy. It is time to sit up in bed, rub your eyes and wake up. You have got to be a smart man to win a dishonest profit. There is no routine in dishonesty. You must do new men tomorrow because the ones you did today are on to you. The problems facing you today are not merely political problems; they are moral problems. Did you ever have reason to believe that those men who had confidential relationships with Aldrich of Rhode Island, who sneaked ambiguities into the tariff, were the stamp to be called on by honest men to develop America? Some of our bond holders believe the private interests should be served whether the public interest is served or not. This is getting so conspicuous that it is not polite to refer to it. This belief has impregnated our national congress. There are too many keepers of secrets there, but the chief keeper has now been retired to public life. We are now witnessing the blessed process of retirement. We don't want any more of exclusive privilege. We are trying to do away with that now -- cleaning house, as it were. We want a good broom, one that will play the part of the people. The initiative and referendum are excellent things -- good brooms, but the recall is the most wholesome reminder. It suddenly calls time on your when you try to work a game on the public. You don't find republicans as deeply devoted to their party now as heretofore. They are forgetting that the Republican party is carrying out a sacred trust for the country. Nor has the Democratic party any sole mortgage on the devices of liberty. The world is a pretty poor bronco to buck. It will chuck you sooner or later. There is no mistaking the signs of the times. If you insist on standing for the old order of things you are bound to be upset. If you see an avalanche coming your way go on sitting; you will never be missed. There are thousands of men in America who have no conscience but they have a weather eye. What conscience they have may start it but the weather eye is going to do the rest. Governor Woodrow Wilson of New Jersey came to Pasadena this morning; he saw and was conquered. As the ex-president of Princeton university and possibly next President of the United States viewed the beautiful homes of Pasadena for the first time he could not find adequate language to express his thoughts. It was from the big porch of the country club that Gov. Wilson had his second view of Pasadena and the surrounding country. "I want to get out on that porch to see what the prospect affords," he said to W.F. Knight, after the formalities of introduction had been done with. From his coign of vantage Governor Wilson had an excellent view of the broad golf links upon which several ladies were attempting to lay up scores. "Beautiful, magnificent," he exclaimed while the Pasadenans looked on and smiled. "What a charming country this is. I should like to come out here to live were it not that I have an official engagement to keep at home." At this moment Professor Chamberlain was introduced to the governor. "You have deserted the craft, Governor, however, I think you have deserted us at a most propitious time," Professor Chamberlain facetiously remarked, in reference to Governor Wilson being a former president of Princeton university and an educator. "I am afraid I am sliding down the scale," Mr. Wilson replied, laughingly. The governor was assured there were but two Democrats in Pasadena, but that would not interfere with the reception that the citizens had planned for him. He accepted these little quips with a smile and always was ready to retort with like pleasantries. As of 11 a.m. today an advisory for voluntary evacuation of the Florecita neighborhood in Pasadena has been lifted. Residents of the area may return to their homes and are advised to monitor local television and radio news and the city website for updates. All Pasadena residents and businesses should review their personal, family and workplace emergency plans and make sure their emergency preparedness kits are up to date. More information about disaster preparedness can be found here or by calling the Pasadena Fire Department at (626) 744-7276. Smoke and ash from the Station Fire are particularly heavy today, so everyone is advised by the Pasadena Public Health Department to avoid outside activity, especially elderly residents, children, people who have heart or respiratory health issues, and those whose immune systems are compromised. TAMMY please email me at aerdman@cityofpasadena.net and I'll tell you what you won! 1. Which came first: Pasadena, California? Or Pasadena, Texas? 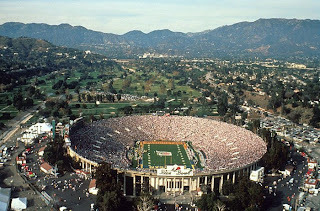 The answer is Pasadena, California. The Texas city was named for the California city. 2. What level of Leadership in Energy and Environmental Design (LEED) certification did City Hall receive after the retrofit project? Project managers had the goal of achieving silver, but went on to win the gold! 3. 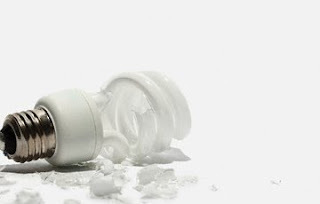 What's the best way to dispose of a compact fluorescent bulb (CFL) in Pasadena? Pick up a special pouch at any number of locations listed in this link, then drop the broken or burned-out bulb at one of the locations. Don't throw CFLs in the trash! 4. Name one of the ways you can get an inspection report for a restaurant in Pasadena. Visit www.cityofpasadena.net/publichealth and click on Environmental Health to enter the name of a restaurant into the online database. Or you can go to any restaurant in Pasadena and ask to see the most recent inspection report, which by law must be accessible to you. 5. What are the six types of MoveAbout Tours you can take between now and Sept. 27? 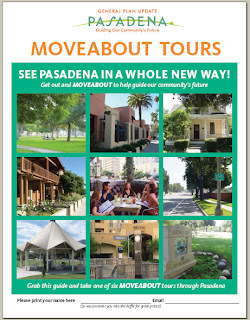 See a complete guidebook, or download each individual tour, at www.cityofpasadena.net/generalplan. It's also available in Spanish. The streets are Florecita Drive, Florecita Way, Florecita Lane, Florecita Terrace and Crestford Drive. 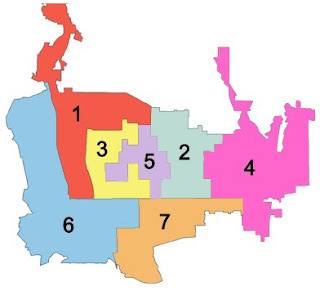 All residents of this District 1 neighborhood are strongly encouraged to pack important personal belongings and vital records, and go to another location away from potential fire hazards. Do not wait for a mandatory evacuation order! There is no imminent danger for this neighborhood at this time, but a shift in weather patterns could create a hazard situation. Pasadena fire engines and personnel are waiting nearby to protect homes and other structures if the need arises. Any resident of the neighborhood who does not have an alternative place to go, such as a friend’s or relative’s home, can go to an evacuation site that has been established at Jackson Elementary School, 593 W. Woodbury Dr. in Altadena. The American Red Cross Pasadena-Pomona Valley Chapter is staffing the site and the Pasadena Humane Society has set up a portable animal shelter for pets. Periodic media briefings will be conducted at the evacuation site by Los Angeles County Fire Department and Pasadena Fire Department. See this page of our city website for more information about evacuation. Here's the latest Pasadena alert. I intended to post Woodrow Wilson's remarks to Pasadena today but am still waiting on a readable copy of the second page of that day's Pasadena Daily News. The copy I have is pretty fuzzy. Stay tuned! In the meantime, how about a little trivia? The first person with all the right answers will get something far and away better than the fabulous prize for Mystery History! Congratulations to Susan Carrier, who wins with her guess "Woodrow Wilson on the campaign trail?" 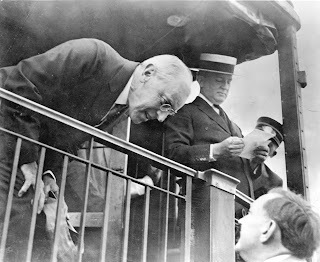 In the 1911 photo above, New Jersey Governor Woodrow Wilson leans over the railing of a caboose during a stop in Pasadena on a cross-country campaign tour. He was elected the 28th president of the United States the following year. 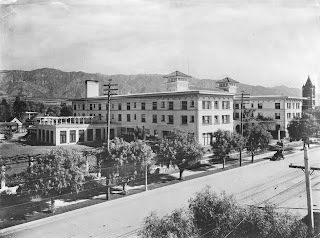 The people of Pasadena hosted a luncheon for the candidate May 11, 1911, at the Hotel Maryland, shown in the photo below. Few such public utterances on national questions have ever been heard in Pasadena before. Not even the semi-divine Roosevelt came out as strong on his cherished subjects as did Governor Wilson. 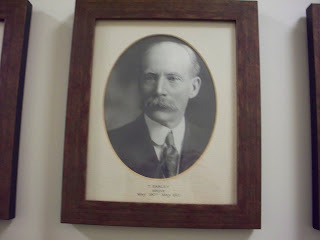 Assuming Mayor Thomas Earley was at the luncheon, here's his portrait from the Hall of Mayors. As I did with the big reveal about President Theodore Roosevelt's visit to Pasadena, I'll post Governor Wilson's remarks tomorrow. Many thanks to Pasadena Public Library and Pasadena Museum of History. Who are these people? And what's happening? The person to guess correctly will win a fabulous prize! 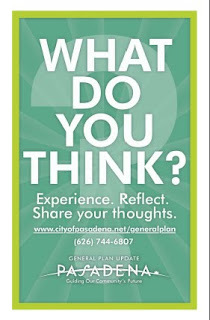 As Pasadena’s General Plan is updated, it's important to include the perspectives of everyone in the community. 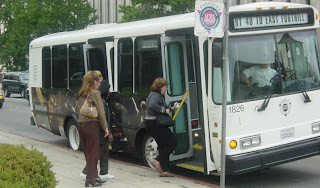 The City of Pasadena is making it easy for you! From Aug. 22 through Sept. 27, you can take one or more MoveAbout Tours and share your thoughts with city planners. Each of the six self-guided tours has been designed to highlight specific issues such as residential density, walkability, bikeability, architectural design, open space, re-use of historic buildings and more. Guidebooks with simple instructions, background information, questions to consider, maps and more are available at locations throughout Pasadena including City Hall, public libraries and community centers. Look for this poster -- the MoveAbout guidebooks will be nearby. The ARTS Bus and Walking Tour combines a ride through Pasadena’s biotechnology and health care district and a walking tour through one of the community’s oldest residential neighborhoods. On the Bicycle Tour you'll experience a variety of streets designated or soon-to-be designated for bicycle travel, visit several parks and see the city’s latest solar installation. Driving? On the Driving Tour East you'll experience a neighborhood that's transitioning from residential to industrial uses, a group of suburban-oriented residential and commercial developments, and some of Pasadena’s ethnic commercial business districts. 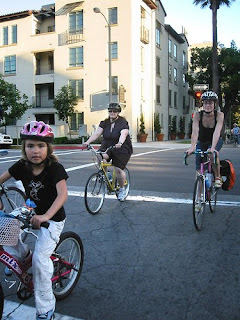 You can also choose the Driving Tour West to experience the diversity of Pasadena’s built landscape as you drive from the health care and biotechnology corridor to a thriving transit-oriented urban center and historic northwest neighborhoods that are in transition. If you haven't traveled via light rail lately, go on the Gold Line Tour! 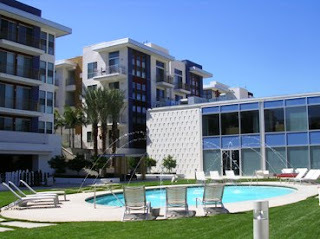 You'll visit four of the six stations in Pasadena and experience some adjacent mixed-use housing and commercial developments. If you love the great outdoors, you'll love the Open Space Tour that includes a full range of Pasadena’s parks, community gardens and more. The MoveAbout Tours are part of a community outreach effort that has been launched to help Pasadenans speak their minds about four of the most important elements (chapters) of the General Plan: Land Use (where different types of buildings should be located), Mobility (how we get from place to place), and Open Space and Conservation (how open space and natural resources should be preserved). These critical elements will guide how Pasadena grows and changes, how parks and open space are prioritized, and how people will move around town in the future. Yesterday City Manager Michael Beck hosted a lunch-hour ice cream social in the courtyard for employees. Several department directors pitched in to help with scooping duties. Starting with the city manager in the foreground and moving to his right: Michael Beck, Fire Chief Dennis Downs, City Clerk Mark Jomsky, Finance Director Andy Green, Assistant City Manager Steve Mermell, Deputy Police Chief Chris Vicino, Human Services and Recreation Director Patsy Lane and Housing Director Bill Huang. An ice cream social wouldn't be complete without all the trimmings! That’s Susan Soto, a graphic designer in our Print Shop, facing forward. Below are (left to right) Jackie Scott, who manages the adaptive recreation program; Peggy Palmer, executive secretary in the Fire Department; and Robert Gorski, accessibility and disability coordinator in the Human Resources Department. Thanks for the fun break, Michael! I stumped everybody again! I love this image so much that I assumed it must be iconic. 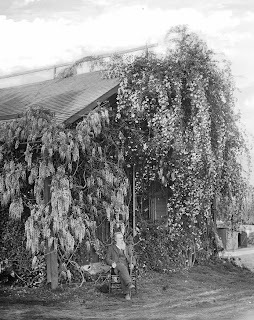 In the photo above, Jeanne Carr is standing on a balcony at her 22-room home "Carmelita" at 470 Kensington in 1892, the last year she would live there. 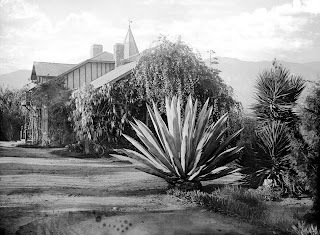 The 42-acre property was bordered by Colorado Street to the south, Orange Grove Boulevard to the west and Fair Oaks Avenue to the east. Mrs. Carr was quite an accomplished woman in her day. She was an expert horticulturist who planned and planted what would become known as Carmelita Gardens and, years later, Carmelita Park. Her husband, Dr. Ezra S. Carr, was a medical doctor and career educator who had been a professor of chemistry, agriculture and natural history at the University of Wisconsin before moving on to UC Berkeley and then spending the twilight of his career as the superintendent of public instruction for the State of California from 1875 to 1880. While living in the Bay Area, the Carrs traveled many times to Pasadena. During one such trip they purchased the 42-acre property and planted orange groves that were a highly successful venture for them as they planned and saved for eventual retirement to the area. Once they moved permanently to Pasadena in 1880, they opted out of the citrus business and built a boarding house of sorts on the property. 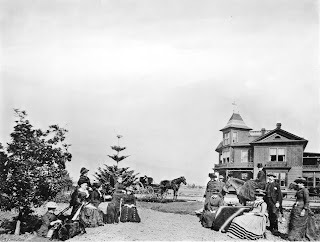 It was actually an early cultural center where many famous people came to stay for extended periods of time, including John Muir, Ralph Waldo Emerson, Helen Hunt Jackson, Theodore Lukens, William Keith and Helena Modjeska. Mrs. Carr also established a successful horticulture school for women on the property. Here are the Carrs at a rustic cabin that was on the property when they purchased it. They loved it so much they could never bring themselves to demolish it. 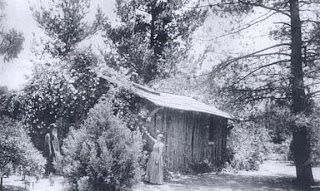 Helen Hunt Jackson wrote part of her novel “Ramona” in this little cabin. Mrs. Carr set the standard for refined Pasadena landscaping in that era, such as using hedges instead of fences, planting flowering shrubs and trees, etc. 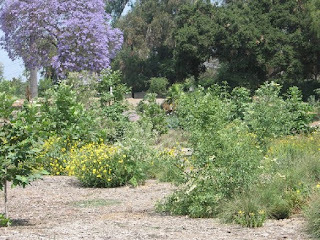 Carmelita had the most extensive garden in Pasadena, filled with plants from all over the world. Some were planted by John Muir himself. He had been a student of Dr. Carr's at the University of Wisconsin; Mrs. Carr was a mentor to Muir and encouraged him to get his papers published. I've seen your sunny Pasadena and the patch called yours. Everything about here pleases me and I felt sorely tempted to take Dr. Congar's advice and invest in an orange patch myself. I feel sure you will be happy here with the Doctor and Allie among so rich a luxuriance of sunny vegetation, How you will dig and dibble in that mellow loam! I cannot think of you standing erect for a single moment, unless it be in looking away out into the dreamy West. I made a fine shaggy little five days' excursion back in the heart of the San Gabriel Mountains, and then a week of real pleasure with Congar resurrecting the past about Madison. He has a fine little farm, fine little family, and fine cozy home. I felt at home with Congar and at once took possession of his premises and all that in them is. We drove down through the settlements eastward and saw the best orange groves and vineyards, but the mountains I, as usual, met alone. Although so gray and silent and unpromising they are full of wild gardens and ferneries. Lilyries!--some specimens ten feet high with twenty lilies, big enough for bonnets! The main results I will tell you some other time, should you ever have an hour's leisure. I go North to-day, by rail to Newhall, thence by stage to Soledad and on to Monterey, where I will take to the woods and feel my way in free study to San Francisco. May reach the City about, the middle of next month. . . . In 1892 the Carrs sold the property to Simeon Reed, founder of Reed College in Oregon. 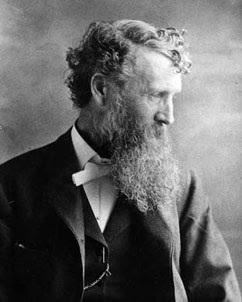 He and his wife Amanda had great plans for building a new home for themselves at Carmelita, but Simeon Reed died of a stroke in 1895. Mrs. Reed continued to live in Pasadena until her death in 1905. OK, so fast forward to 1941. 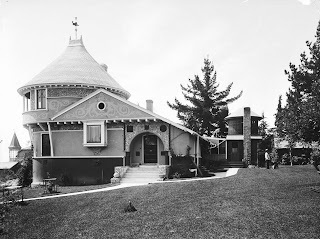 The property was gifted to the City of Pasadena on the condition that the Pasadena Art Institute could be located there. The institute leased the property for 20 years on the condition that a permanent museum be constructed on the site. 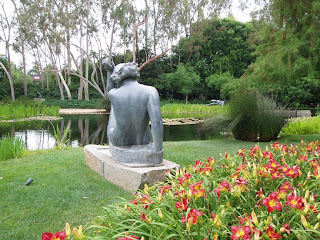 Since 1975 the Norton Simon Museum has occupied about seven acres that are still owned by the City of Pasadena. Some of the trees and shrubs in the Norton Simon Museum gardens are more than a century old and planted by Jeanne Carr and others, but most of the gardens are more recent. Many thanks to Pasadena Public Library, Pasadena Museum of History, University of Southern California and Norton Simon Museum. 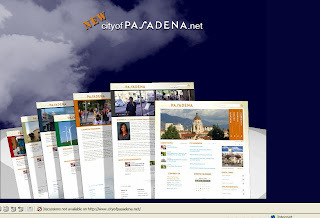 The new and improved www.cityofpasadena.net will be launched the middle of next week and a preview is on the site now! One click on the orange “Preview New City Web” button leads to an online example of how the remastered site will operate. Click on “Comments and Suggestions” to provide input and feedback on the preview. The redesigned website will feature a clean, uncluttered design that incorporates iconic images drawn from across Pasadena. Flexible navigation options will allow users to click on slider controls at the top of the home page to view many new pages developed around themes for residents, visitors, business and government. Links organized along these themes will also be in the footer section at the bottom of every page. The “Quick Links” and “Online Services” areas at the right side of the page will offer drop-down menus that will allow users to click on most-requested items, information about city departments and services, and elected officials. Those who can’t find what they’re looking for will be able to use the powerful search box at the upper right-hand corner of every page. With just a few quick clicks, the upgraded navigation will get users to the specific pages they need. Organization will be improved throughout the site, including press releases and latest news, an “FYI Pasadena” section with key announcements about items of broad community interest, and an interactive calendar with events happening in and around Pasadena. 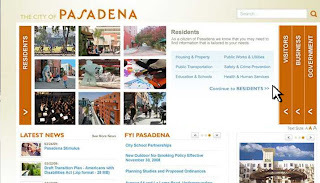 Based on a new content management system, the new www.cityofpasadena.net provides more flexibility to position and maintain content throughout the site for more effective communications. After the launch of the improved website next week, additional features and functions will continue to appear on the site as the project moves forward. Aha! I stumped you this week. 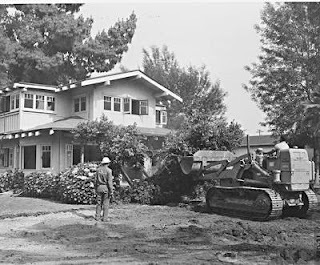 In the photo above, a demolition crew prepares to raze the headquarters of the San Gabriel Valley Council of Campfire Girls in Memorial Park to make way for the Pasadena Senior Center. City directors ordered an immediate start on preparation of plans for a Senior Citizens Center in downtown Memorial Park after two years of discussion. In finally choosing the Memorial Park location, directors sidestepped a triple recommendation that the proposed $90,000 facility be built at Jefferson Recreation Center, 1501 E. Villa. After lengthy studies, the city Planning Commission, the Recreation Commission and the Pasadena Commission for Senior Citizens had all backed the Villa Street location. The Pasadena Senior Center opened on May 22, 1960, in Memorial Park. You'll find more history of the center here. We have excellent camps for outdoor activities but still need a permanent local headquarters. Since we left Memorial Park, we have been in temporary headquarters, but a housing committee is now at work formulating plans for what we hope may be a permanent home. Many thanks to Pasadena Public Library researcher Stephanie Hough. He Couldn't Just Blow Out 50 Candles! Calvin Wells, deputy chief of the Pasadena Fire Department, celebrated his 50th birthday on Friday in very unusual way. There was no cake, no candles or balloons. 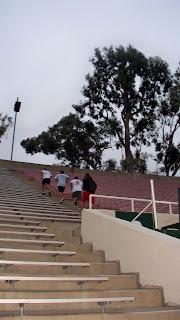 Instead, he ran up and down every one of the nearly 2,200 steps at the Rose Bowl Stadium! When Calvin was a young firefighter, he ran the stadium stairs regularly. After all, when it comes to fitness, firefighters need to be at the top of their game so they can carry people down stairs, pull heavy hose lines up hillsides, battle structure fires, remove victims from inside wrecked cars, and more. See the little white rectangles at intervals all around the interior of the stadium? Stairways go from the field all the way to the top of the stadium at each of those intervals. When Calvin finished the stair run -- in just under an hour! -- he headed for the 50-yard line while everybody cheered. A check was presented to the Ronald McDonald House in Pasadena. The Pasadena Firefighters Association has been sponsoring the facility for many years. On Friday, a few Pasadena firefighters who won $4,800 in a national fitness challenge turned the winnings over to this wonderful organization that provides a community-supported home away from home where parents and families of critically and terminally ill children can stay while the little ones are receiving treatment at Huntington Hospital and other nearby medical facilities. Calvin came up to where I was sitting, about halfway up the stadium, and joined me for a chat. He was tired but very contented with his accomplishment! 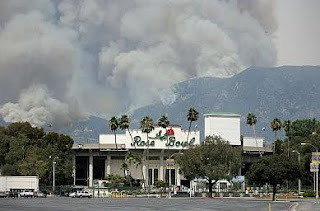 To see a couple of examples of media coverage, here's KTLA-TV (channel 5) and here's the Pasadena Star-News.